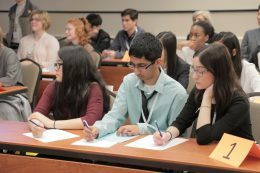 National Japan Bowl Registration Now Open – The Japan-America Society of Washington, Inc.
WASHINGTON, D.C. – Registration is now open for the 26th National Japan Bowl, which will be held at the National 4-H Conference Center in Chevy Chase, Maryland. The competition will take place from April 12-13, 2018. Online registration will run until January 12, 2018, but those who register by the early bird deadline of December 31, 2017 will have one $60 teacher fee waived. All schools in the United States and its territories that teach Japanese are welcome and encouraged to attend the National Japan Bowl. Financial support may be offered through the local Japan-America Society. Although many teams come from regional Japan Bowl® competitions across the nation, it is not a pre-requisite to participating in the National Japan Bowl. Close to 200 students participate each year, and many of them compete at the national level for all three levels of Japanese language study. The National Japan Bowl is also an event for students to form friendships with others who have the same interests, and for teachers to network and share professional resources. In addition to being a language and culture “quiz bowl,” the Japan Bowl offers hands-on workshops about Japanese arts and culture, fun activities for students, and seminars about studying abroad in Japan. Created in 1992, the National Japan Bowl is recognized today as the premier national academic competition for high school students of Japanese. Over the course of two days, students are asked questions about the Japanese language as well as Japanese culture, society, daily life, history, geography, and current events. The also take part in a “Conversation Round” that assesses their ability to communicate effectively with a native Japanese speaker. The National Japan Bowl has enjoyed support and encouragement over the years from the United States-Japan Foundation, the Embassy of Japan, the Japanese Ministry of Foreign Affairs and the Ministry of Education, Science and Technology, the Japan Foundation, and the American Association of Teachers of Japanese. More information about the National Japan Bowl and the regional Japan Bowls can be found at www.japanbowl.org. For all inquiries or questions about registration, please contact the Japan Bowl Program Manager Nancy Marsden at nmarsden@jaswdc.org or (202) 833-2210.